Automatic pond fish feeders let you automatically feed fish in ponds, enabling you to choose digital feeding schedules that can be customized (Source). These are handy devices to have if you want to feed pond fish and grow a healthier and bigger wildlife population (Source). Directional fish feeders will precisely direct and aim the food into your pond as opposed to tossing it onto your pier, which will waste it and attract land varmints (Source). Though, you will have to safeguard the pond fish feeders from intrusive varmints and sometimes weather-proof the fish feeder to ensure it lasts for the long-term (Source). The Moultrie 6.5 gallon Feedcaster is our top pick- it features a digital timer which will allow you to program feedings up to six times a day that last for 1 to 20 seconds apiece, directional casting of fish food in straight paths all the way out to 25 feet and is easily hung on a nail, plant hook, or a small chain. 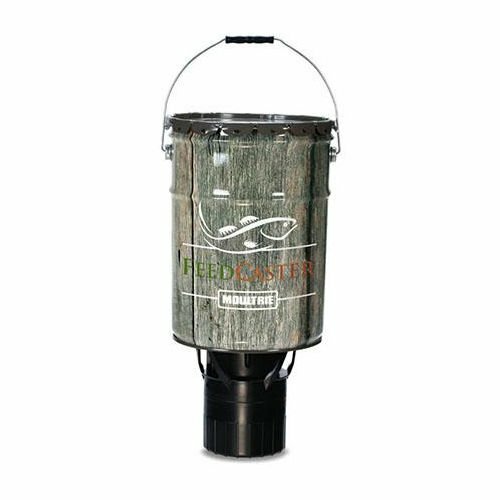 Each feeding cycle can be customized with different run times and the 6.5 gallon bucket can hold around 50 pounds of fish feed. That said, some users have had trouble with land animals messing with their units- so user consensus is a bit divided concerning its efficacy. It will really depend on your particular set up, with some users reporting that they built a simple PVC stand to prevent varmints from harassing their automatic pond fish feeders. Let's take a look at five of the best-selling automatic pond fish feeders on the market today and see how they compare. The lightweight, easy-to-use automatic pond feeder by Moultrie is a great option that has a 6.5-gallon bucket which can carry up to 50 lb of feed. Its users are pleased that it is great at dispersing feed with little spillage, but also note that it seems to stop working after a period of time. It has a digital timer which can be programmed for up to 6 feeds per day, is directional – casting the feed out in a straight path, and comes in a wood dock finish which is aesthetically pleasing. This fish feeder is a smart choice if you are looking for a cost-effective automatic feeder. The overall review for Moultrie’s 6.5-gallon feeder is that it is convenient and works well although there are a few customers who complained that the feeder dispensed too much or too little food or that the food didn’t come out very quickly. A large number of reviewers say that they are happy with the price. Many customers have complained that it stopped working after a relatively short period of time or that particular pieces broke, but many others claim to have used it for many years in a row. There is a small minority of customers who have said that the device does not work at all and that they would not recommend it to anyone. While most customers say it was easy to set up there are a few that have said it was difficult, one of them stating that there were no instructions for mounting the feeder. The small, mountable Flexzion automatic fish feeder is a great option that has a simple to use LCD screen, allowing you to program up to 99 days of feeding. Its users like that it can accurately distribute up to 4 feedings throughout the day, but also note that the instructions are somewhat difficult to follow. It has a 215ml feeding tank which can hold up to 80g of fish food, patented anti-jam and anti-clog features, manual or automatic feeding options, and easy to clean detachable feeder parts. This programmable fish feeder is a great choice if you are looking for a low-priced but effective automatic feeder. Generally the reviews for the Flexzion feeder are very positive with only a handful of people stating that they are having problems with it. 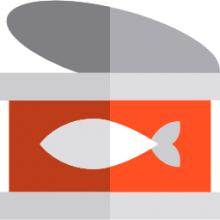 Many reviewers remarked at the reliability of the device, saying in reviews that they don’t need to worry about feeding their fish anymore. Although the mounting systems are well received by most customers, a small number of people found they were unable to mount the feeder in their type of tank. One reviewer of the product claimed that they had to grind the flakes into smaller pieces in order to fit through the small feeding hole and another stated that it would jam from the pellets they were using. Several reviews have reported that the instructions are complicated with one user being completely unable to make the product work. The slow dispensing, weatherproof pond feeder from Fish Mate is a cheap option that is designed to work in all ponds and large aquariums. Its users like that it is very inexpensive, but also note that it is very difficult to calibrate it to dispense the correct amount of food. It is capable of storing up to 21 days worth of food in its large hopper, has a reliable and accurate quartz timer, and a 1 year battery life. 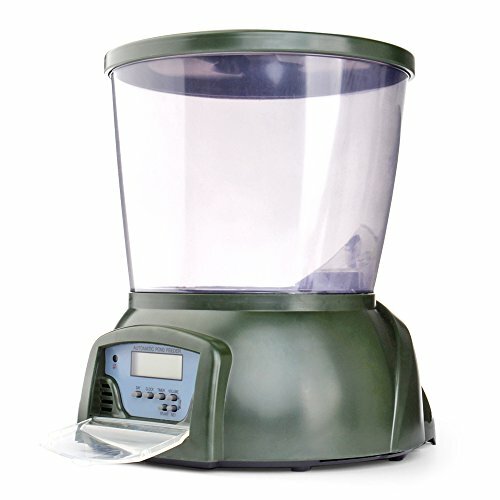 This automatic feeder is a poor choice if you are looking for a good-quality feeder for your pond or aquarium. Although a handful of customers do stand behind the Fish Mate automatic pond feeder, the overall consensus on it is rather negative. Many reviewers claim that after turning it on and leaving for vacation they returned to find that the feeder had no been dispensing food while they were away. It is allegedly difficult to program and there is a lot of trial and error involved to get it to distribute the amount of food that is desired. It is also easy for animals to break into. One user zip tied it shut to avoid raccoons getting inside however they weren’t too upset about this inconvenience. Due to only being capable of one long extended feeding certain users stopped using the product. Some reviews stated that it would stop working if it became too wet. The 3 lb, programmable Fish Mate P7000 fish feeder is a fantastic option that can dispense varying feed portions up to 3 times per day. 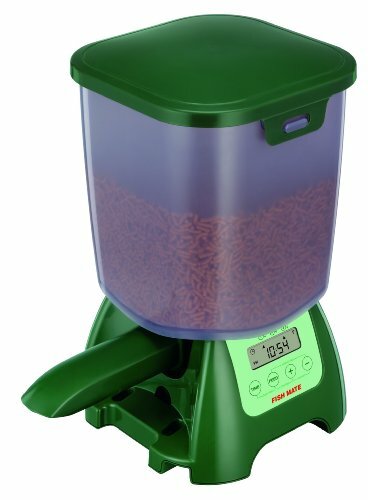 Its users love that it is great at dispensing the correct amount of food pellets, but also note that it is very difficult to program. It has a 6.5 lb hopper which can hold up to 30 cups of dry fish food in the form of sticks or pellets, a convenient LCD display, dishwasher safe food contact parts, over 6 month battery life, unique mechanism that accurately measures feed sizes, and a snap lock lid to keep animals out. 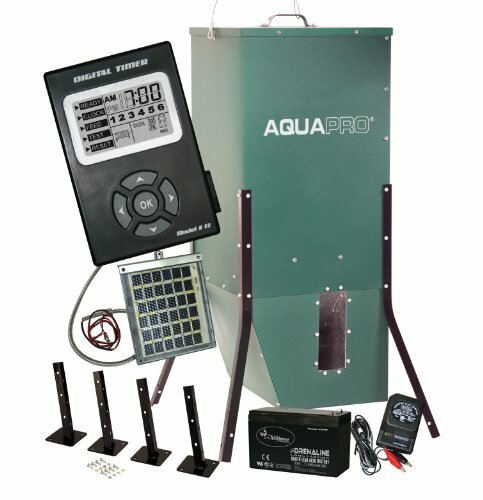 The P7000 is a great option if you are looking for a reliable automatic pond feeder for dry food. 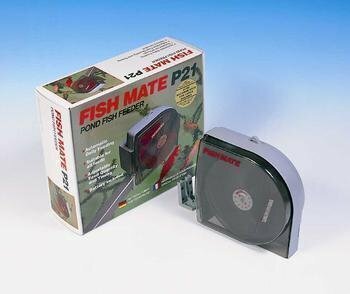 Reviews for Fish Mate’s P7000 say that it is a great product. It’s on the expensive side, but it has a large capacity and is quite sturdy. Although it doesn’t state that it is waterproof, several users have also claimed that it does not function well in high humidity as the food will get soggy and clump. This is likely due to the lack of waterproofing. Some reviewers said that it is easy to knock into the water and damage, with one in particular explaining that raccoons had knocked it in. Various users have also reported that it will dump quantities of food that are too large for smaller fish to handle and one said their fish died due to overfeeding. The easy to fill, rodent proof directional feeder kit from Wildgame Innovations is an expensive option that can propel feed up to 45 feet away. Its users like that it can distribute feed over a large area, but also note that some of the parts malfunctioned. It is quite heavy at 76 lb, has a timer which can be programmed to have up to 6 feed times which can be set to last from 1 second to a minute and a half, and comes with a 12v solar panel which can be used for charging. This low-profile directional feeder is a questionable option if you are looking for a long range automatic pond feeder. Overall the reviews for Wildgame Innovations’ low-profile feeder are mixed. Many users say it is a high-quality feeder and have had no issues with it while others have complained about the product not working properly. One customer said that when they attempted to set it up the legs fell apart. Another user explained that there was a problem with the timer when they bought it and they had a lot of difficulties getting it to work. Other customers have reported parts breaking rather quickly or that it jams easily. A few customers claimed that the instructions were hard to follow or that there were instructions for various models making the set-up confusing and misleading. A user also claimed that the product comes with only enough screws to put it together and has no spare screws in case some are damaged or defective. Most private fishing ponds all are situated on private land and the land owners have designed them as part of their landscaping or it's possible that a natural pond has existed on their particular piece of property for many years. These private fishing ponds are great natural wonders that allow you to enjoy the pleasures of open water as well as a private stock of fish. Many private fishing pond owners will fill them with fingerlings, which are really just baby fish, that are purchased from a commercial fish hatchery or they will have them ordered from a federally-owned hatchery. It's common knowledge that if you try to stock your pond with fish species that you have caught, sometimes they do not breed or live well in the unfamiliar ponds. If you are looking to purchase an automatic fish feeder, you are doubtlessly looking for a way to make feeding the fish in your private lake or pond as simple and easy as possible. These automatic fish feeders will allow you to set daily schedules to feed your fish as you would like-and they generally run on 6 V or 12 V batteries. There are a variety of different types and styles of automatic fish feeders that can fit your purposes- some are solar-powered, some are equipped to hang from a nail like bucket feeders, some sit on four legs, and the most common and useful feature is the directional feeding functionality that allows you to throw the feed in one direction, unlike feeders that will supply deers their food that will throw in 360° patterns. If you are looking to purchase an automatic pond fish feeder, check out our reviews above and reference the individual product pages to get deeper insight into how other users are using their fish feeders to supply their ponds and lakes with food.